Georgia State was the 34th American university to sponsor an esports team when they did so in the fall of 2017. The team has backing from the university and a designated building to call home in the Creative Media Industries Institute (CMII). This backing gives the team confidence to grow as an asset to the university. Georgia State and Georgia Southern have the only university-sponsored esports programs in Georgia, but Cole Gibson, digital media producer for Georgia State esports, believes without a doubt that they are the state’s best. With its potential, Director of CMII, David Cheshier thinks the esports team can become absorbed by Georgia State Athletics in the future. Brawlhalla, League of Legends and Smite are the games the Georgia State esports team competes in within the National Association of Collegiate Esports. Georgia State esports previously existed as the Panther Gaming Club and played in the same tournaments before being officially sponsored by the university. Panther Gaming Club is still an active organization on campus, but today it serves more as a development team for new players. “What I’m trying to establish as the esports direction of the Panther Gaming Club should just be that pipeline [to the sponsored team]. It’s what I wanted to happen for the esports program like most college programs. 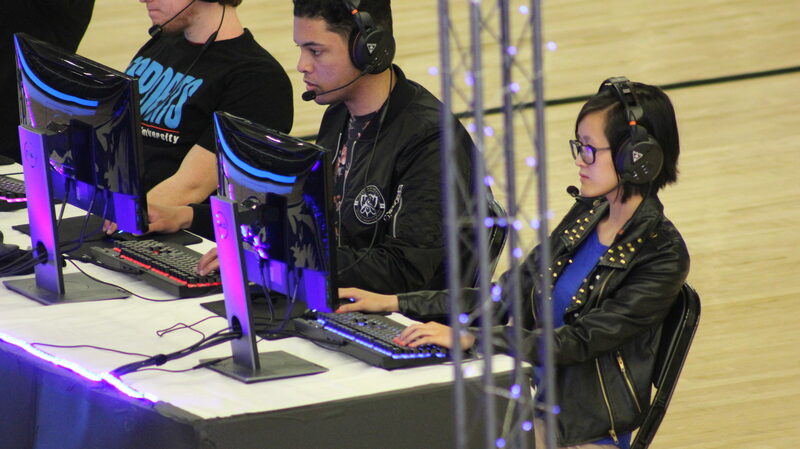 That’s gonna be our prerogative; we get the people in, we get them a place to play until they’re good enough to take a starting spot in the esports program,” Gibson said. Georgia State esports scholarships differ significantly from Georgia State Athletics’ teams. When a men’s basketball player is brought in on scholarship as a freshman, tuition is free until the player graduates. On the esports team, nothing is guaranteed. Open competitions for scholarships are held on a year-by-year basis for every position on all three teams. This keeps players on their toes and adds pressure to improve their skill over the summer. If someone loses their position on the sponsored team, they’ll typically rejoin the Panther Gaming Club rather than join another amatuer team because of the familiar faces on campus. “For our Overwatch team, before they got picked up and our Smite team as well, it was, ‘I’m good, and my team—everyone I know is a student here so I see them all time … We have that chemistry and that synergy and we’re all good to go,’” Gibson said. From the outside looking in, esports can be played without practicing in-person with teammates, but the same principles that apply to a contact sport apply to esports. In 2017, Pittsburgh Steelers running back Le’Veon Bell skipped training camp and only practiced with the team for one week before the season began. It was clear that the team’s rhythm was out of sync and it took a few weeks to get back to normal. “They think, ‘Why does it matter if they see each other in person? Everything is online.’ It’s because you want that chemistry, that synergy,” Gibson said. “We coexist all of the time, and that really does come up in games. Getting that synergy outside of the game can have a positive impact inside of the game, which is something that people don’t see a lot. “A lot of people would rather play with people at school, rather than people just online in Wisconsin,” Gibson said. Esports is not a whole-body sport like volleyball or soccer—players sit in chairs for long durations and solely use their hands. Any upper body injury can be a huge disappointment for a team. Asim Baghadia, who plays the attack damage carry position on Georgia State’s League of Legends team, has been injured for an entire season due to a cyst on his lower back. Gibson is very impressed that Baghadia tried to fight through his injury and play some matches. Baghadia ultimately had to sit out, but Gibson plans to work out so he can build his endurance and strength to play longer hours. “It was a feat,” Gibson said. “Esports is different from any other sports, where you can leave and come back and almost be the same skill level depending on how well your rehab is. Much like the saying goes for America’s three biggest professional sports, esports is a business first. The year-to-year change in games bring uncertainty to its athletes. Nameless, the gamer tag for a well-respected Call of Duty player in the gaming community, was pushed out of professional leagues because of changes in a new version of the game. Gamers in the community wondered why teams didn’t pick him back up, but he simply wasn’t performing at a high level anymore. Withdrawals are a real problem for athletes when their careers end. Practices for amatuers can last nearly 14 hours per day and even longer for professionals. Professional esports leagues are expanding the industry from just gameplay to other avenues in order to help their athletes as they exit the leaderboards. Nameless landed a broadcasting job after his final season and found a niche in his post-gaming career. Gibson speaks with the University System of Georgia Board of Regents on Sept. 11 to discuss esports’ future.